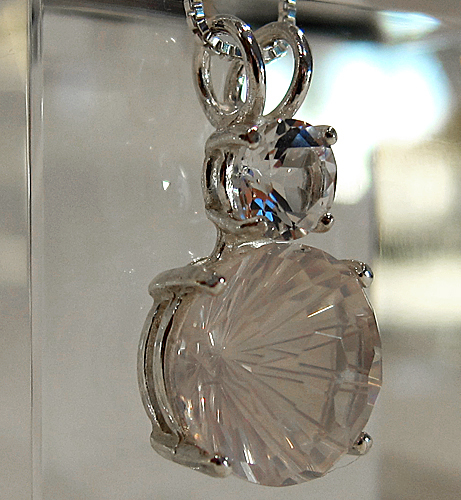 Dimensions (HxWxD): 0.875" x 0.5" x 0.375"
This stunning Super Nova Rose Quartz pendant with White Topaz accent stone is of exceptional quality, both in the cut of the stones and in the simple sterling silver settings which allow the stones to breath and function at their highest vibration. Each pendant comes with an 18" sterling silver chain so that the pendant will lay upon the thymus, between the compassionate heart and the throat chakras imparting support both emotionally and mentally. This new stone cut by Paul Jensen of Tools of Evolution line of sacred geometry power cut jewelry originally had no name last year, when we first saw them as pendants. They've been aptly named Super Nova, which describes their complexity of facets, which so closely resembles a honeybee hive, with its many faces of hexagonal design. Both the setting & the wire hangers on these earrings are made of sterling silver. This remarkable pendant combines two spectacular cuts. On the back of the Rose Quartz gemstone is a modified Millennium Cut, a starburst pattern that was created in the early years of the 21st Century by master jewelers to reflect the emerging consciousness of a new millennium. The front surface of the Rose Quartz gemstone is laced with an intricate pattern of flat hexagons, like a honeycomb or the eye of a honeybee. The compound eye of a honeybee consists of an array of hexagonal visual sensors designed to maximize the honeybee's ability to detect tiny movements in shadow and in the lower, infrared light frequencies, enabling the honeybee to achieve maximum awareness of predator movements in deep shadow and also provides amazingly acute peripheral vision. The honeycomb is also composed of hexagonal cells, so we call this cut the honeycomb cut, and this unique cut is said to help the bearer to bring to consciousness all the information that is normally held subliminally, in the unconscious mind, or which is in the periphery of consciousness and awareness. This honeycomb cut pendant can help to render the bearer much more acutely perceptive, and to enhance the critical spiritual faculty of discernment, which is so vital to us all in today's rapidly changing, tumultuous global environment. It is difficult to capture both the millennium cut back faces of the pendant and the honeycomb cut in photos, but you can see at least one or two of the hexagonal faces on the surface of this remarkable pendant in this photo. These Super Novas have substantial gemological and metaphysical value, have incredible light shining through the rosy ray & sparkle! Wear these lovelies to light up your days & nights! 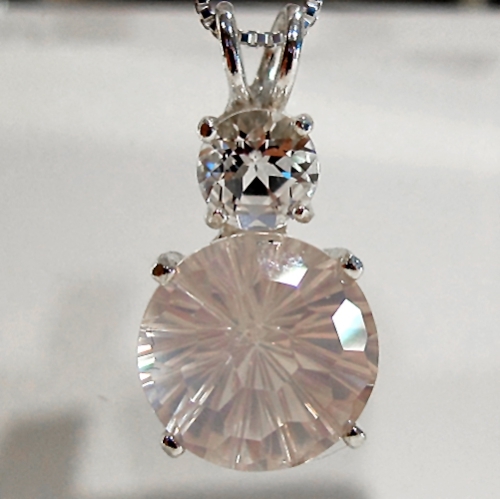 Rose quartz resonates with the energy signature of the heart chakra, according to the Western mystery school chakra system, and this gemstone quality rose quartz pendant receives, amplifes and transmits an extremely high vibration of unconditional love and open-hearted compassion originating in Higher Worlds. Rose quartz projects a soft, soothing, gentle energy , and is especially supportive in cases where an individual is developing the capacity for self love. It sends out an energy of unconditional love, as compared with passionate love, which is why the energy of rose quartz resonates with the heart chakra rather than the lower chakras. This is a gently healing gemstone, allowing for the slow opening of the heart to healing and loving energies. It supports the wearer or bearer of this stone in all spiritual practices and daily activities that promote the development of compassion for all beings -- and especially for oneself. Topaz is an extremely hard gemstone composed of Aluminum Fluorsilicate, which often grows as orthorhombic crystals in igneous, high-temperature rock formations. Gem quality Topaz can be found in a variety of colors, from colorless to pale greenish-yellow, yellow, orange-yellow and even blue. Topaz is a prismatic crystal which seems to hold the qualities of the etheric, both as an attractor and as a conductor. It aids in manifestation through catalytic action "while the vibratory resonance acts with an ethereal magnetic effect" and can be used to manifest health and to "correct disorders of the body" according to Melody. She further states in her book, "Love is in the Earth" that topaz is "a stone of true love and success in all endeavors". Topaz gets its name from the ancient Red Sea island once known as "Topazios", now called St. John's. Legend has it that the word "Topazios" meant "to seek" and that the island where this stone was first found was always surrounded by thick fog, making access to the stone difficult at best. Topaz has been considered a valuable spiritual ally by the African bushmen for millennia.Their shamanic practitioners have used Topaz in traditional healing ceremonies, to connect with spirits departed from the Earth plane, and especially to attract wealth and health. Topaz is known as a stone of love and worldly success. Topaz infuses the wearer with confidence while dispelling the fog of self-doubts and expels negativity from the user while encouraging attitudes of playfulness, joy and creativity. For these reasons, Topaz is thought to be the ideal stone to strengthen attitudes and energies of self-love. "The ends and facets of a topaz crystal provide both positive and negative currents," says Melody. "This is quite different from quartz. These alternating currents are linked via the ethers to the forces of manifestation through which attraction and desire are promulgated. When a request is directed through the topaz to the object or to the thought form which is desired, the topaz acts as a conductor for the message - sending the message to the ethers via a closed circuit of current which penetrates the energy field related to manifestation. The message is then relayed to the universal mind which, in turn, refines the information and assures that the intent is for the good of all, before sending the transmission directly toward actualization on the physical plane." Above weight is shipping weight. Net Weight: .20 oz. Each piece is unique and may vary slightly in appearance. Each piece is guaranteed to be beautiful and to meet with your complete satisfaction!